I cannot update vuforia from the Vuforiaconfig panel using the link in the inspector. I download the package but get the attached error. I update this today, set the directory C:\Program Files\Unity\Hub\Editor\"the folder of the version of unity what you need update"
Still can't get the darned thing to work. Unity program named as default 'Unity' inside 'Unity' directory. Could you share a screenshot of your directory structure as well as the error from the package installer? I'm in the same boat - can't get it to install, not recognizing Unity.exe. Do you know where the hard drive Unity installed? You should change Vuforia install location to that hard drive & check again. In my case, after install Vuforia update 7.2.20 for Unity 2018.2.0f2, my project display error like image attach. Does any one have these issues? Thank for your support! When applying any update like this to Unity on Mac, you'll need the Unity version you are wanting to apply the package to needs to be located in the Applications/Unity directory. Mac OS does not allow you to select where you install it like Windows OS does. 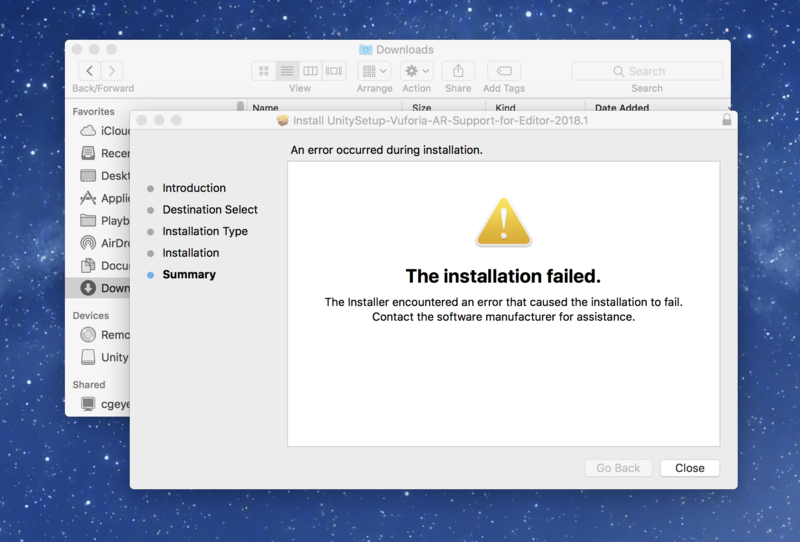 You'll need to rename your Unity install's directory to "Unity" and try to apply the patch again.